Last night Representative Justin Amash hosted a Town Hall Meeting at the Ford Museum in Grand Rapids. The auditorium was about half-full, which would make the turnout around 200. Amash talked briefly before the question and answer period and addressed only one major political issue, the “fiscal cliff.” The West Michigan Representative has received a fair amount of attention recently because of his stance on this issue, which has resulted in him being removed from the Budget Committee. Amash stated that the country needs to spend less than what it does now, in order to balance the budget, a comment that elicited a strong applause. However, Amash made numerous comments that had a populist tone to them all night, but there was never much substance to back it up. This is a theme we will return to later. Representative Amash stated that the agreement to avoid going over the “fiscal cliff” is temporary and will only prolong the problem. The country, he believes, is in really bad shape financially and it will continue to be a problem, especially for the poor. Amash said that both Democrats and Republicans have both not done a good job on spending and that both parties are responsible for the nation’s economic woes. However, his answer to how the problem is solved was “if the public understands the problem, which is different than trying to get the politicians to understand.” This is either a naïve statement on his part or just a diversion, since the public needs to do more than understand the problem for real change to take place. The last thing the Representative addressed before opening the night up to questions from the audience, was to talk about his commitment to transparency. It is not secret that he regularly posts on Facebook how he votes, so that constituents can see where he stands on issues. This is certainly better than what most federal politicians are willing to do, but just posting a brief explanation of how he voted is not enough for real transparency. Amash rarely puts a hyper-link to the actual legislation, so people can read the language for the themselves and he rarely provides much context for the vote as it relates to the larger picture of whatever issue he is voting for. A better site for transparency is VoteSmart.org, where you can check the voting records of all politicians. You can also view them by most recent votes or by topics, which provides the public with a more comprehensive view of how any politician votes on particular issues like Trade, Health Care or Military Spending. This writer counted 17 different questions that were presented to the Congressman during the Q & A period. Most of the questions came from people who clearly supported Amash and made no bones about their affiliation with the Tea Party or Libertarian wing of the Republican Party. This was evident to anyone present, since people either said they were members of the Tea Party or they use language in their questions to reflect a specific way they saw politics in the US. Virtually everyone who asked a question expressed nothing short of contempt for the government, with statements about corruption, theft, lack of transparency, no regard for the public and no regard for real democracy. Some people who asked questions discussed the Federalist Papers, some the Federal Reserve and silver and others asked Amash why he hasn’t left the Republican Party. The Congressman addressed many of these questions with kind of an answer. Despite Amash’s statements about how the government is broken, he believes in working within the system, even if it means personally talking to each member of Congress. Amash is not interested in leaving the Republican Party, but he acknowledged on numerous occasions that both parties are to blame for the state of the country. Some one asked him about the Tea Party Movement and its ability to affect change? He said that the Tea Party and Occupy both have had an impact on politics as usual, but he offered no concrete example to substantiate his claims. Another person asked him about term limits, which he said he supported. 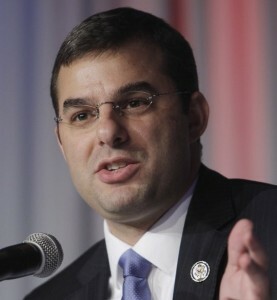 Amash said that some members of Congress have been their too long and have lost touch with their communities. They live just outside of DC in the wealthiest part of the country, in Virginia. Amash even stated that many in Congress were wealthy before they got there, which is how they can get elected. This analysis also brought a loud applause from the audience. However, Amash’s solution to the financial corruption of government was that both parties needed to change. Again, populist rhetoric, but only mild reformist tactics were suggested for action. There were some question from people who had a different perspective or at least different concerns from those who were in the majority in the room. One person said that the immigration system is broken, and asked how do we fix it? Amash thinks we need to have a system where people can come and work freely in the US and have access to becoming citizens. “There needs to be a better system in place. A big reason why so many who come illegally is because it is too difficult to come in.” Amash also said that the government shouldn’t just be able to grab people and deport them, even though that is the policy of the current administration. In fact, deportations have increased dramatically under the Obama administration. Another person with the Micah Center in Grand Rapids said they were holding a large meeting on immigration reform in March and wanted him to commit to being there. Amash responded by saying that they should talk to his staff afterwards to work out a date. In the end it seems to this writer that while the rhetoric of Amash seemed anti-establishment, when confronted with what calls to action, the Congressman made sure that people should still put their faith in reforming the government from within. He did advocate that the public needs to be better informed so it could pressure the government to change. While this is a popular notion it is naïve to think that the systems of power in this country will give up that power based on public pressure, at least not the kind of pressure that Amash was suggesting.